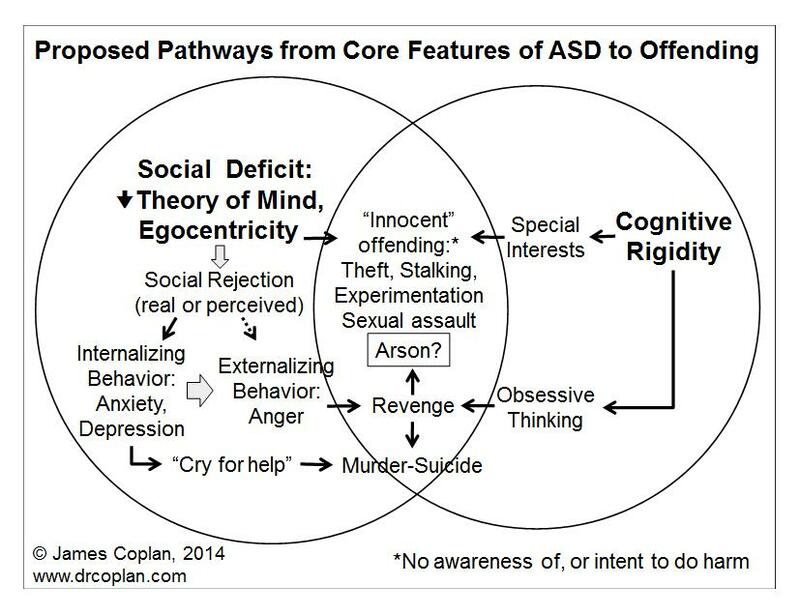 Finally, I’ve added a pathway coming in from the right, labeled “Obsessive Thinking.” This is the same trait we encountered earlier, when discussing “innocent offending”. The person who is obsessed with computers may become a hacker; the person who is obsessed with a particular movie star may become a stalker. If, instead, the person is obsessed with thoughts of having been wronged, then the obsessive thought pattern fuels anger. We’ve all been there: We get irked at someone. Usually we are able to “let it go” (although it may take a while). What if you could never let it go? What if all of the wrongs and hurts you experienced (whether real or imagined) were indelibly added to a mental list, and you dwelled on that list endlessly? Not by choice, but because your brain was wired that way? Newtown and Isla Vista also exemplify Wing’s item #7: “Revenge against family.” The first person Adam Lanza killed was his mother. Framing Adam Lanza’s behavior as revenge, rather than dismissing him as someone who was “just crazy,” or “evil,” makes us stop and think: Revenge for what? And why did he feel that he had no recourse but to shoot his way out? (Vulnerability, on Wing’s list.) Persons with ASD often manifest black and white thinking. They often catastrophize (i.e. blow something up out of proportion). Did these cognitive traits play a role in shaping Adam Lanza’s behavior? In an eerily similar way, Elliot Rodger (we still don’t know if he had AS) spoke of killing his stepmother and his younger brother. He seems to have resented his stepmother because of perceived rejection, and his younger brother simply for being normal. As it happened, Elliot was not living at home, so his luckless housemates rather than his family were his first victims. 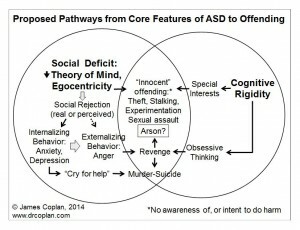 Of course, none of these pathways are unique to persons with ASD. What we don’t know is the relative risk stemming from these pathways in persons with ASD compared to persons with neurotypical development, what tips the balance from potential behavior to actual behavior, or what to do about it. More next time. Internalizing behavior is often overlooked until it’s too late. Newton and Columbine were not just “mass shootings.” They were suicides. For many shooters, despair and rage are intertwined, leading to tragic final outcome.